• ...and any other moving-image format. 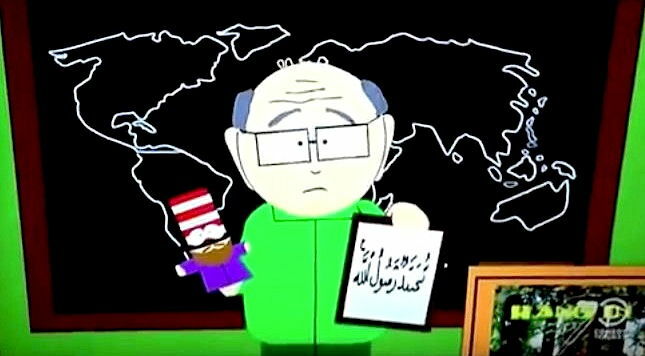 By far the most famous among these are the various appearances of Mohammed in the animated television cartoon South Park, as well as the live-action film Innocence of Muslims, since in both cases the publicity surrounding Mohammed's appearance (or possible upcoming appearance) spurred riots and protests which lead to deaths worldwide. Every instance of Mohammed appearing in these broadcasts, as well as several lesser-known videos and shows, are presented below. 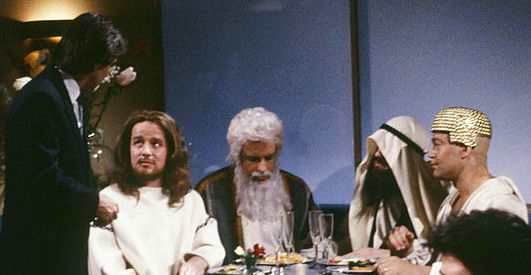 On January 28, 1989, the television comedy show Saturday Night Live broadcast a sketch entitled "Jesus Christ Celebrity" which featured an actor portraying Mohammed. The plot revolves around four religious figures trying to enjoy a meal at an upscale New York restaurant but who are constantly interrupted by fans of Jesus asking for his autograph and for him to perform miracles. Jesus tells Mohammed not to be jealous, saying that if they were in Mecca, Mohammed would be the popular one. The cast includes Tom Davis as Mohammed, Phil Hartman as Jesus, Kevin Nealon as Moses, and Al Franken as Buddha. As the pictures above reveal, at some point in the sketch Mohammed and Buddha switch seats; in the top image, Mohammed is on the far right, but in the second two images, Buddha is on the far right and Mohammed is next to him. The top image was found at IMGur here, while the bottom two images were screen captures submitted by Archive readers. Over the years, Mohammed has been a character in five different episodes of the animated television sitcom South Park -- but only in the first of the five Mohammed-themed episodes was he ever actually shown in full -- while in the other four, Mohammed is either depicted as a censor's black box or is disguised in some other way. All five episodes are discussed here. 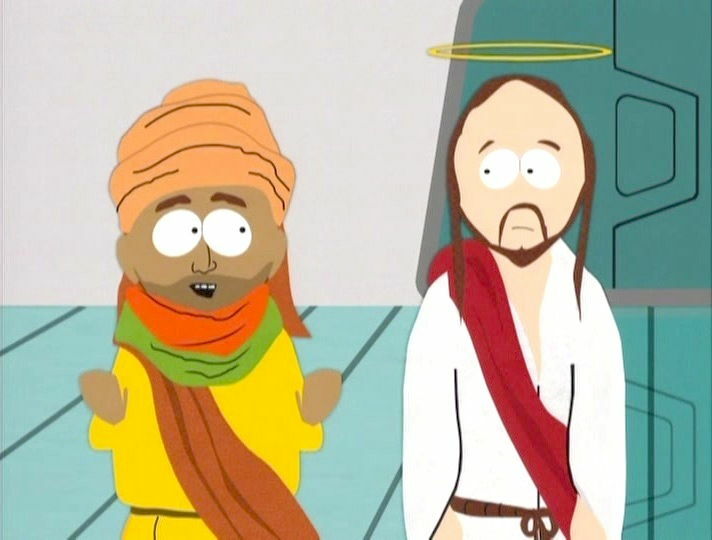 The first South Park episode featuring Mohammed as a character, and the only one to ever realistically depict him, was titled "Super Best Friends," and aired without controversy on July 4, 2001 -- before 9/11, and thus before most fundamentalist Muslims were aware of what was happening in American culture. As a result, the episode generated no protests, no terror threats, and no censorship. 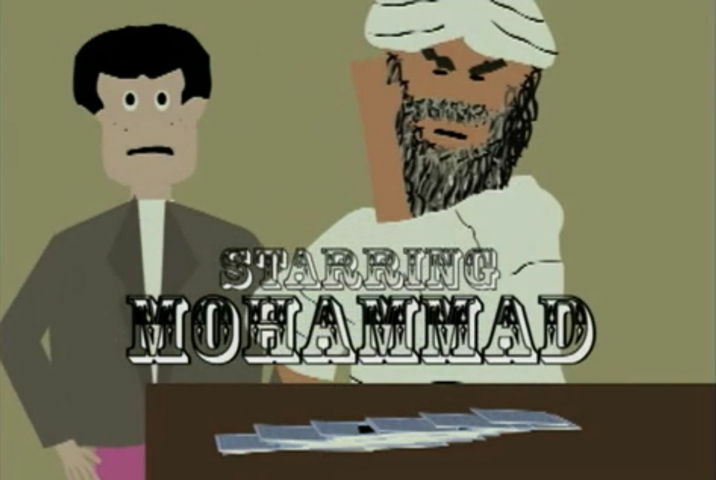 Comedy Central, South Park's parent network, had no problem with Mohammed appearing on the show at that time. 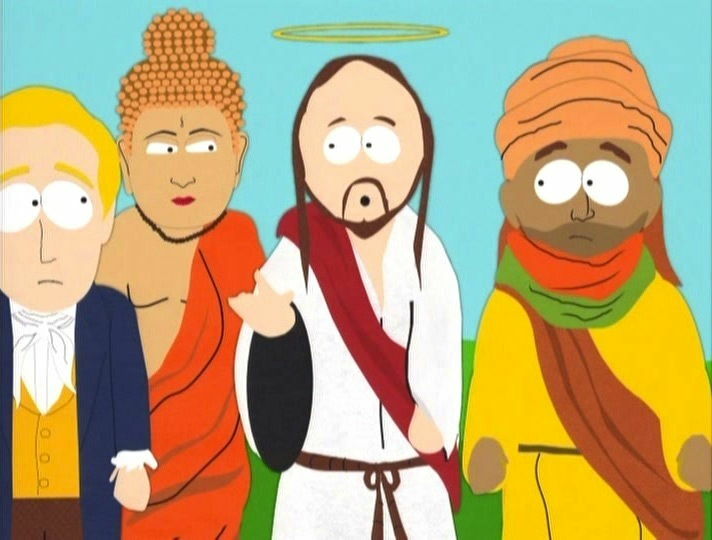 The plot of "Super Best Friends" involves a team of religious superheroes -- in particular Jesus, Mohammed, Buddha, Moses, Joseph Smith, Krishna, Lao-Tzu and "Sea Man" -- trying to free the South Park boys from a cult. 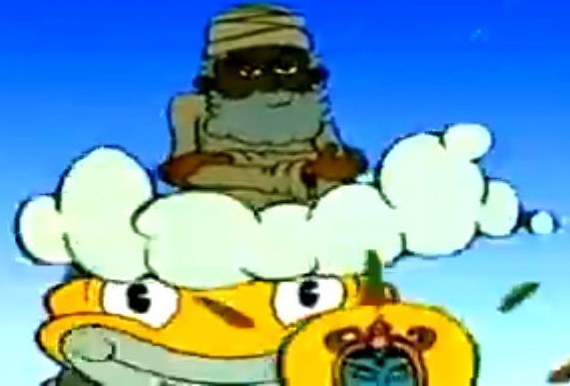 Mohammed (seen here on the left, with Jesus on the right) is depicted repeatedly throughout the episode, not as a villainous character, but instead as a helpful "best friend" with superhero powers. 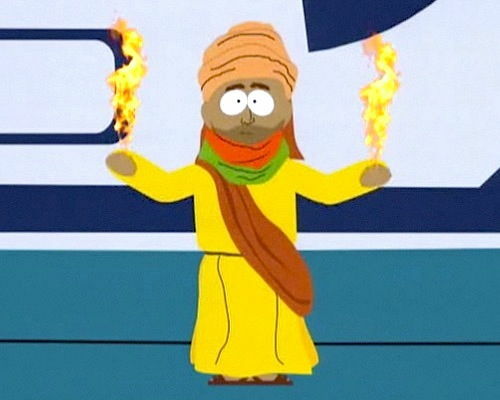 Mohammed's super-power was the ability to shoot fire from his hands. Jesus explains something to Joseph Smith, Buddha and Mohammed. Mohammed points something out, after the climactic battle. Lao-Tzu, Krishna, Joseph Smith and Mohammed. 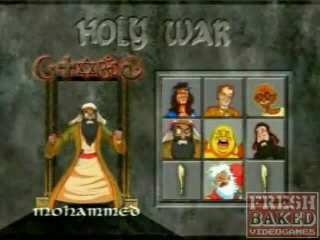 On April 5 and 12, 2006, two related South Park episodes, entitled Cartoon Wars Part I and Cartoon Wars Part II, both focused on the controversy surrounding depictions of Mohammed -- but ultimately, neither episode ever showed Mohammed directly, instead each time representing him as a black box indicating that his image had been censored. The convoluted, self-referential plot of the double episode revolved around the (fictional) plan of a rival televised cartoon, "Family Guy," to show Mohammed on one of its episodes, sending the South Park residents into a panic that terrorists will retaliate against everyone in America. 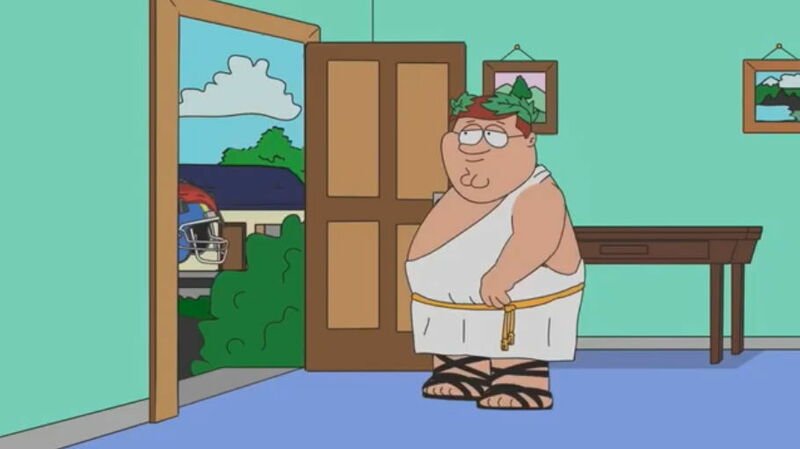 On April 5, 2006, Cartoon Wars Part I was first broadcast on Comedy Central and included within it a parody of a Family Guy episode in which the lead character, Peter Griffin, walks with Mohammed to buy some iced tea from Mr. T. This fictional Family Guy "episode" was "censored" (as part of the South Park episode's plot) to only show Mohammed as a black box with the words "Image censored by Fox" -- Fox being the network which airs Family Guy. (Screenshot above from IMDB.) No realistic rendition of Mohammed was ever shown in Cartoon Wars Part I. 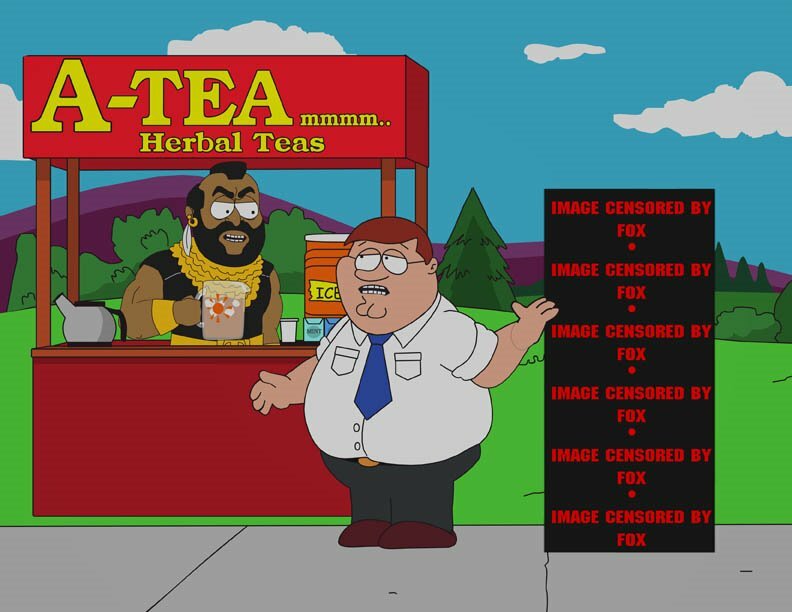 After walking a short distance down a sidewalk, the parody-version of Peter Griffin and the censored-version of Mohammed arrive at Mr. T's "A-Tea mmmm.. Herbal Teas" stand. The scene satirizes both the absurd taboo against showing Mohammed as well as the juvenile and unfunny jokes on the real "Family Guy" show. Cartoon Wars Part I can currently (as of 2017) be viewed in full online here at LiveLeak, but Comedy Central continuously strives to get all versions of the episode taken offline; if LiveLeak does eventually delete the video at Comedy Central's request, fans of South Park usually upload it again somewhere else, in an ongoing cat-and-mouse game with Comedy Central's legal team. Cartoon Wars Part II, broadcast a week later on April 12, 2006, continued the same plot started in Part I, with South Park character Cartman trying to get the show Family Guy canceled because it was going to feature Mohammed. The circular self-referential storyline becomes even more convoluted in Part II, which revolves around whether or not Fox network executives will allow a depiction of Mohammed on Family Guy -- while in real life, as the actual South Park episode itself was being animated, the creators were waiting to hear whether or not Comedy Central would allow Mohammed to be revealed on the show-within-the-show. 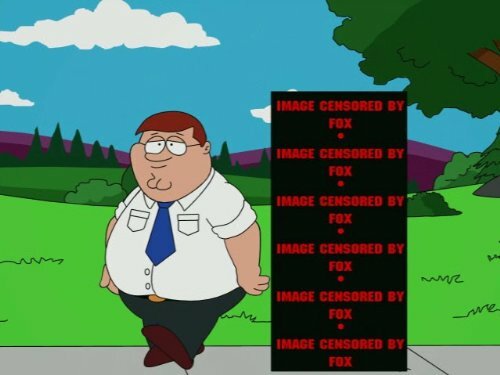 Ultimately, in the fictional story, Fox does allow Mohammed to be shown on Family Guy -- but in real life Comedy Central censored that fictional scene, so the audience never actually sees Mohammed in Cartoon Wars Part II. Part II actually features two different censored versions of Mohammed -- first a fictional-universe censoring, and later a real-world censoring. 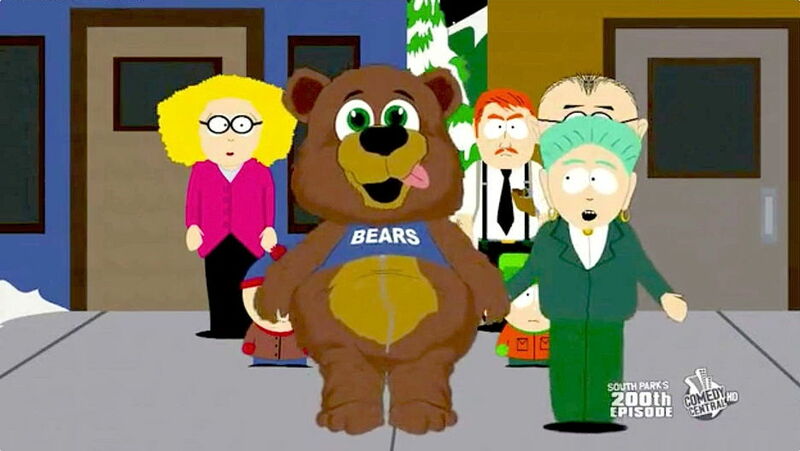 As the (real-world) South Park episode begins, the news about Family Guy's upcoming (fictional) Mohammed episode is interrupted to show a new episode of the (fictional) Canadian cartoon The Terrance and Phillip Show, in which the two lead characters solve a mystery at the Lazy J Ranch with the help of their "good friend Muhammad." However, Mohammed's appearance is (fictionally) censored by the Canadian Broadcasting Corporation: as Mohammed enters the screen riding a steer, his body is covered with a black box and the words "CENSORED BY CBC." This enrages Terrance and Phillip, who complain to the Canadian network executives, to no avail. Near the end of Cartoon Wars Part II, the (fictionalized) Fox network finally allows the (fictionalized) Family Guy episode to show Mohammed in full -- but when that Family Guy clip is shown as part of the South Park episode, in real life Comedy Central censored it, forbidding the animators from actually depicting Mohammed. In the satirical Family Guy clip embedded in the South Park episode, Peter's wife Lois asks him, "Peter, you got a pink slip at work?" 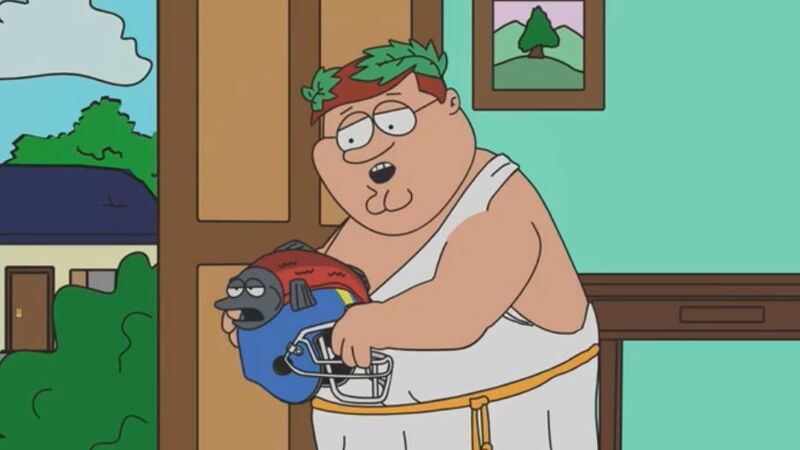 to which he replies, "You think that's bad -- remember the time I got a salmon helmet from Muhammad while wearing a toga?" 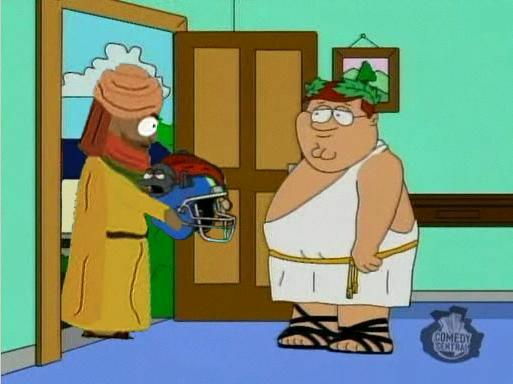 Peter is then shown wearing a toga and opening his front door, where a football helmet with a salmon on top is visible, purportedly held by Mohammed just out of sight behind the door. 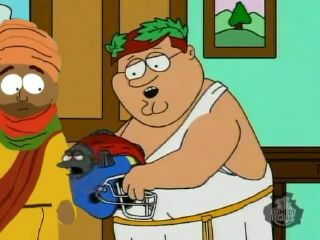 As Mohammed moves forward to where he would have been visible, the screen goes black, and the words "In this shot, Mohammed hands a football helmet to Family Guy" are shown instead. 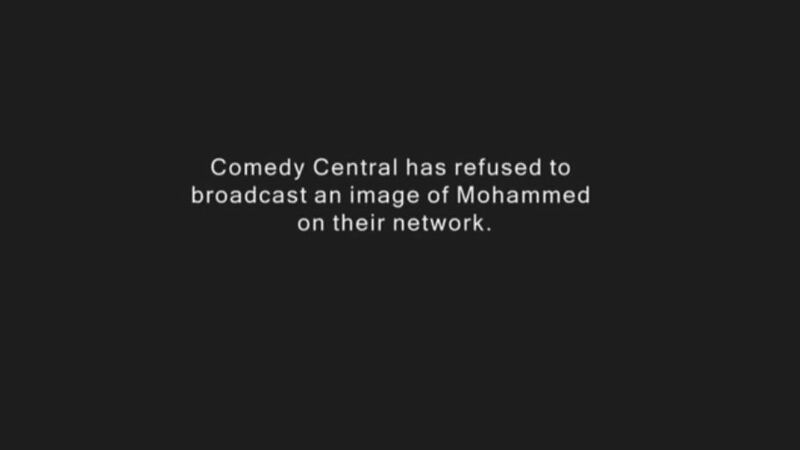 Next, while the screen is still black, a new caption appears, saying, "Comedy Central has refused to broadcast an image of Mohammed on their network." Cartoon Wars Part II can currently be viewed in its entirety at KissCartoon, but as with the Part I video above, Comedy Central may eventually succeed in getting it taken offline. South Park fans were so frustrated that Comedy Central had censored Cartoon Wars Part II that an anonymous prankster uploaded what was claimed to be the "uncensored" version of the satirical Family Guy scene -- but it was quickly identified as a fake, in which the hoaxster took the version of Mohammed from the earlier Super Best Friends episode and photoshopped it into the Family Guy scene in Cartoon Wars Part II. For the sake of completeness, and because the "fakes" themselves count as depictions of Mohammed as well (even though they didn't actually appear on South Park), they have been included on this page anyway (above). Staff members who work on South Park have stated that the real uncensored version of the satirical Family Guy scene was animated and does exist, but it has never been broadcast or released in any format. A low-resolution version of the fake "Family Guy" clip showing Mohammed in full can be viewed here. 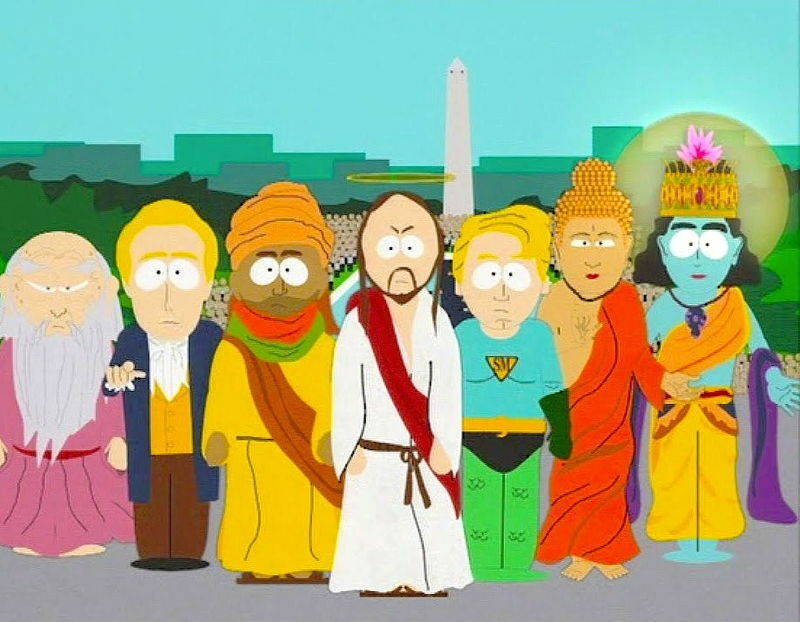 To mark the 200th episode of South Park, creators Trey Parker and Matt Stone wrote a two-part story which revisited every scandal in South Park history, mocking dozens of celebrities and historical figures -- including (needless say) Mohammed. 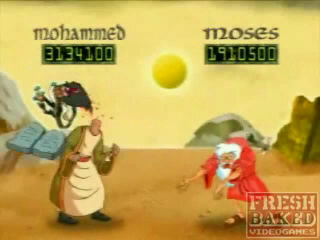 The two episodes, titled simply "200" and "201," created fresh problems for the animators after Muslim extremists once again theatened violence if Mohammed was depicted in the cartoon. As a result, the network bosses at Cartoon Central not only censored Mohammed in the show, but even (in the second episode) censored any mention of Mohammed. The full plot of episode 200, broadcast on April 14, 2010, is described here in detail at wikipedia. The captions for the following screenshots, showing every representation of Mohammed in the episode, follow the storyline step by step. Summary: Tom Cruise leads a group of all the celebrities ever mocked on the show in a class-action lawsuit against the city of South Park. But he promises he will drop the lawsuit if the city delivers Mohammed to him. Cruise's secret plan is then revealed: He wants to kidnap Mohammed to extract his magic "goo" which somehow always makes him immune from mockery -- which the celebrities want to use to protect themselves. But his plan goes awry when a league of red-headed children (also subjected to mockery on the show) kidnap Mohammed instead for their own purposes. The screenshots below were all taken directly from the episode, which is currently viewable online at this Turkish (!!) video site. 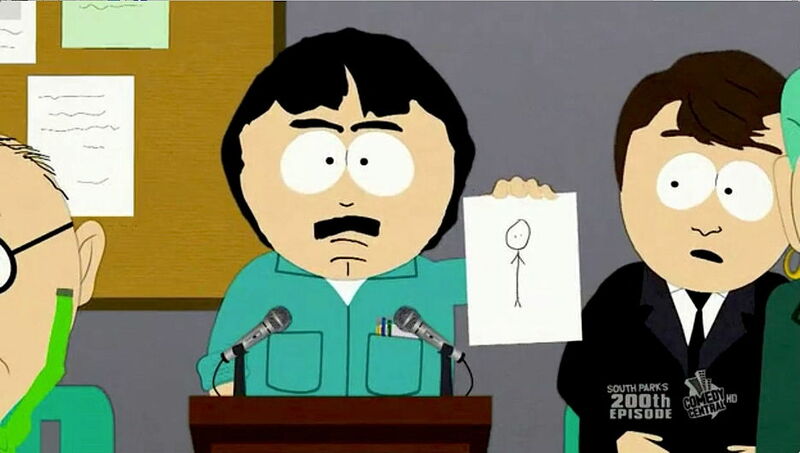 Mohammed is first depicted in episode "200" at the 7:00 mark, shown as a stick figure in a sketch held up by Randy Marsh during a press conference, revealing what Mohammed looks like according to an eyewitness who saw him in the earlier "Super Best Friends" episode. One character then asks, referring to the stick-figure portrait, "Is that OK to show? ", and another replies, "I don't know -- I guess we'll see." At 8:50 into the episode, the Super Best Friends (a squad of religious superheroes) are summoned once again -- but this time Mohammed is censored, and is represented as a black box, unlike in the original Super Best Friends episode from 2001, where he was realistically depicted with no controversy. Later, each Super Best Friend is introduced individually; at 9:08, Mohammed is introduced, but is still censored. Much of the episode revolves around the metaphysical question: What counts as a "representation" of anything? If something (or someone) is shown enlosed in or covered up by something else, does the covering itself count as a representation of the original object or person? The script continually tests this notion, first here at 12:52, when Mohammed (or so we are told) is brought to town inside a U-Haul truck, inside of which his voice can he heard. 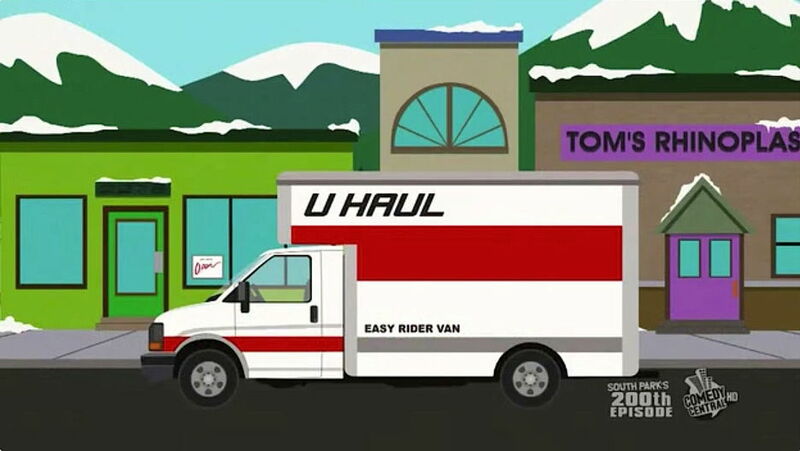 So, in a certain sense, in this scene Mohammed is represented as a U-Haul truck. 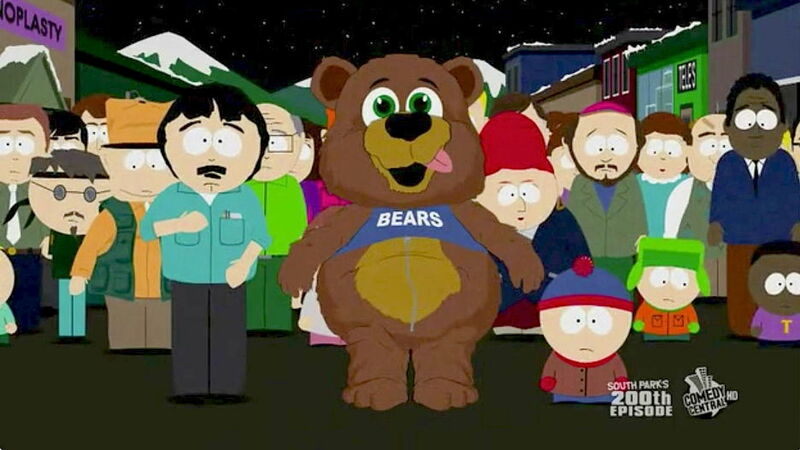 Mohammed is then coaxed out of the truck at 14:28, but to everyone's relief, he is covered head-to-toe in a sports team's mascot costume in the shape of a cartoonish bear. 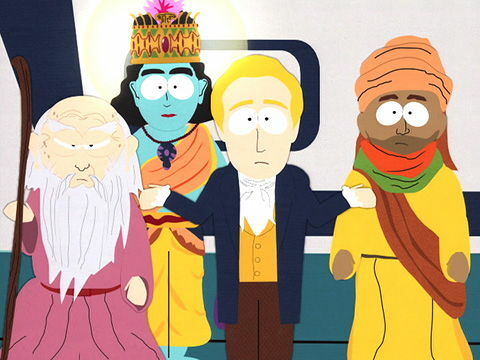 In this scene, and throughout the episode, the residents are terrified that Mohommed will be revealed in full, subjecting South Park to retaliation from Muslims. 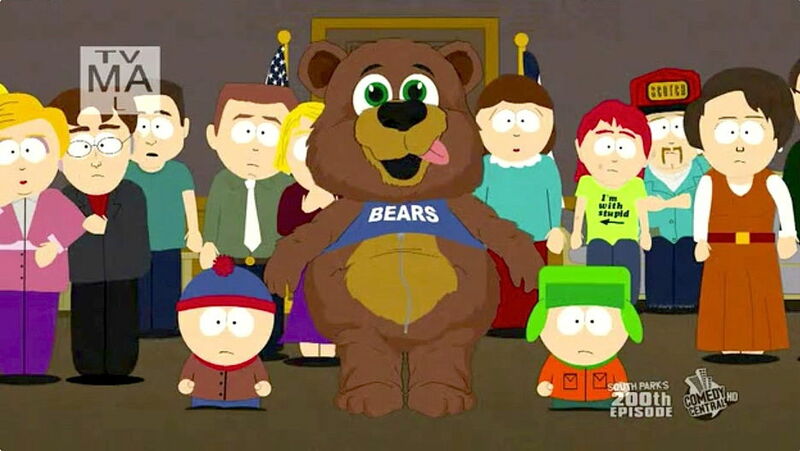 Starting at 16:50, Mohammed is once again shown in his bear-mascot costume, as the residents inform Tom Cruise that the town will not hand Mohammed over to the celebrities after all, but instead to the red-haired "ginger" children (who are threatening violence if their demands for Mohammed are not met). Infuriated, Tom Cruise threatens violence too if Mohammed is not delivered to him. In the climactic final cliffhanger scene, starting at 21:04, the "ginger" children demand proof that the person inside the mascot costume is indeed Mohammed, and threaten to blow up the town that instant if he does not step out of the costume. Episode 201, broadcast on April 21, 2010, continues the storyline started in episode 200. The full plot is spelled out in detail here at wikipedia, and is also revealed step-by-step in the screenshots below. Just as with episode 200, this episode is also freely available for viewing at the same Turkish video site, which is apparently beyond the legal reach of Comedy Central. After episode 200 was broadcast, the fundamentalist Islamic group "Revolution Muslim" threatened violence if (as implied by 200's cliffhanger) Mohammed was revealed in episode 201. Taking that threat seriously (too seriously according to many), Comedy Central not only censored every appearance of Mohammed in episode 201, but even every mention of him -- so that his name is beeped out each time a character says the word "Mohammed." 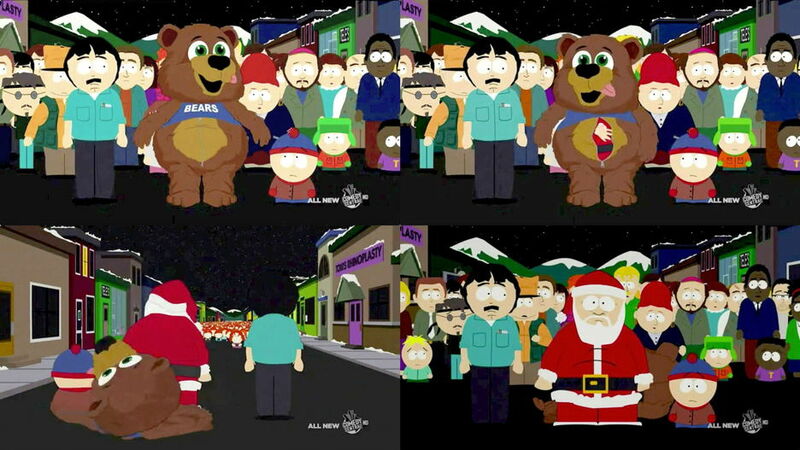 The cliffhanger is resolved at the 2:33 mark of episode 201, when it is revealed to everyone's shock, amazement (and, for some, disappointment) that the South Park boys had hired Santa Claus to impersonate Mohammed inside the bear mascot costume, retroactively revealing that none of the earlier so-called "depictions" of Mohammed in episode 200 showed him at all, since the U-Haul truck and the bear mascot only ever contained Santa Claus, not Mohammed. This multipart screenshot shows Santa, not Mohammed, emerging from the mascot costume. 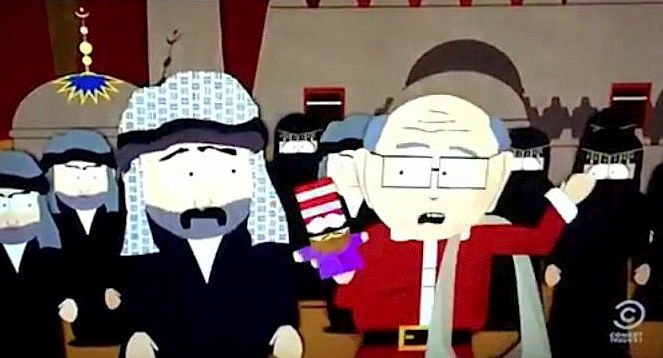 But then one of the South Park boys, Kenny, reveals at 7:02 that he has been guarding the real Mohammed nearby. Comedy Central insisted that any realistic representation of Mohammed be removed from the episode, so the animators represented him once again as a black box with the word "CENSORED." At 8:48, the boys bring Mohammed to a mad scientist's laboratory, demanding that he clone Mohammed so the copies can be handed over to both the celebrities and the ginger kids, staving off the threats of violence. The lab is then overrun by the gingers, who seize Mohammed before he can be cloned. As throughout the episode, he is still represented as a black box. At the 11:34 mark, the gingers negotiate a deal with the celebrities: They will allow Tom Cruise and Rob Reiner to extract Mohammed's magic criticism-immunity "goo," just so long as the celebrities share the goo with the gingers, so that all of them can be rendered immune from mockery. The celebrities agree. At 15:23, Mohammed (still represented as a black box) is placed into the goo-extraction device next to Tom Cruise, as everyone waits breathlessly. Ten seconds later, the machine is activated and Mohammed's magic goo is tranferred to Tom Cruise. At 15:41, the transformation is complete: Tom Cruise (now infused with Mohammed's magic goo) also is rendered immune from mockery, and as a result gets covered with a "censored" box as well! At 17:57, the Super Best Friends arrive to save the day, and a battle royale ensues with everyone fighting everyone else. During the battle, both Tom Cruise and Mohammed are represented as "censored" boxes, but eventually the goo wears off and Tom Cruise reverts to his human form, much to his consternation. The episode concludes, starting at 18:47, with Kyle giving one of his classic "I learned something today" speeches, in which he explains to the audience the moral of the story. But in perhaps the most ironic moment in TV history, his entire speech -- along with speeches by Jesus and Santa Claus -- was censored by Comedy Central, and instead the audience only hears a continuous "beeeeeep" throughout all three speeches. Since that time, Comedy Central has succeeded in having the audio clip itself taken offline, along with a video version of 201's final scene with the audio restored; all that remains now is the transcript seen here. 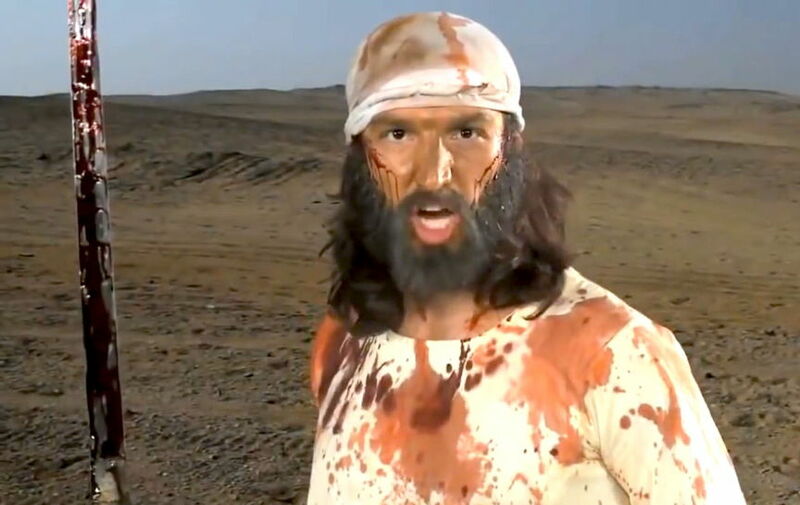 An actor prortraying Mohammed in the 2012 film Innocence of Muslims. Starting in 2011, Nakoula Basseley Nakoula, a Coptic Christian originally from Egypt but living in the United States, decided to make a movie about the persecution of Copts in Egypt and about how the ideology at the root of Islam allows for and even commands oppression of non-Muslims. The film was to include actors portraying Mohammed, his family and followers performing scenes from the Qu'ran and Hadiths -- most of which (from a non-Muslim perspective) show Islam in a bad light. Nakoula rightfully suspected that it would be difficult to find actors for such a controversial film, so he announced in the casting call that it was going to be a film entitled Desert Warrior, an "historical Arabian Desert adventure film." Because none of the actors hired knew anything about Islam, they then unsuspectingly performed on camera many classic scenes recounted in the Qu'ran and Hadiths, even using all the actual names of the real historical personages -- with one exception: Mohammed. Nakoula felt that all he needed to do was change the name of this one character and as a result no one working on the film would even know they were making a movie about Islam, so in the actual dialogue Mohammed was called "Master George." Then afterwards in post-production Nakoula overdubbed every instance of "Master George" with "Mohammed," and the film was transformed from an "Arabian Desert adventure" into a re-enactment of Islamic scriptures which made Mohammed look (accurately) like a villain. The full two-hour film, half about the modern oppression of Egyptian Copts and half about the origins of Islam, was apparently only ever shown publicly once. Instead, a shortened 14-minute "trailer" version leaving out most of the material about Copts and instead focusing primarily on Mohammed's story was uploaded to the Internet with the new title "Innocence of Muslims" on July 1, 2012 by the producer Nakoula under the pseudonym "Sam Bacile," to avoid personal reprisals from Islamic extremists. Since that date, the 14-minute trailer version has been uploaded, censored, deleted, re-uploaded and re-deleted countless times on a variety of video sites by users around the world, and been the subject of multiple lawsuits in various countries. A garbled version of the film's complicated history can be read at wikipedia, but that too has been edited, rewritten and re-edited countless times. The film achieved international infamy and played a major role in American politics when the United States Department of State falsely claimed that a premeditated attack by terrorists against the American embassy in Benghazi, Libya on September 11, 2012 was not a terrorist attack at all but instead a spontaneous protest against Innocence of Muslims that had simply gotten a bit out of control -- leading to the death and dismemberment of the American ambassador to Libya, Christopher Stevens. Confusing the matter, publicity over this attack and its false rationale then spurred numerous real protests against the film worldwide in subsequent days, leading to at least 50 deaths and hundreds of injuries. To cover up its misstatements, the United States government then persecuted Nakoula and jailed him for trivial "parole violations" (such as using a pseudonym while making the film) from a past arrest, as well as intentionally announcing his real name to the world, so that he would be targeted by Muslim extremists seeking revenge. Since Hillary Clinton was Secretary of State during this entire time and was therefore the person responsible for the misleading statements about the film and the treatment of Nakoula, the entire series of incidents surrounding Innocence of Muslims became a major scandal dogging her political career. At the time of this writing, two different versions of the 14-minute trailer for Innocence of Muslims remain online at Youtube: a high-resolution version here and a standard-resolution version here. If these are later taken down, they are almost certain to be subsequently re-uploaded by other users; you can ususally find the current survivors of this cat-and-mouse upload/delete game simply by searching for the phrase "Innocence of Muslims" at YouTube. And if there are none there, the trailer is also usually available at other online video sites, such as Vimeo, LiveLeak, DailyMotion, etc. 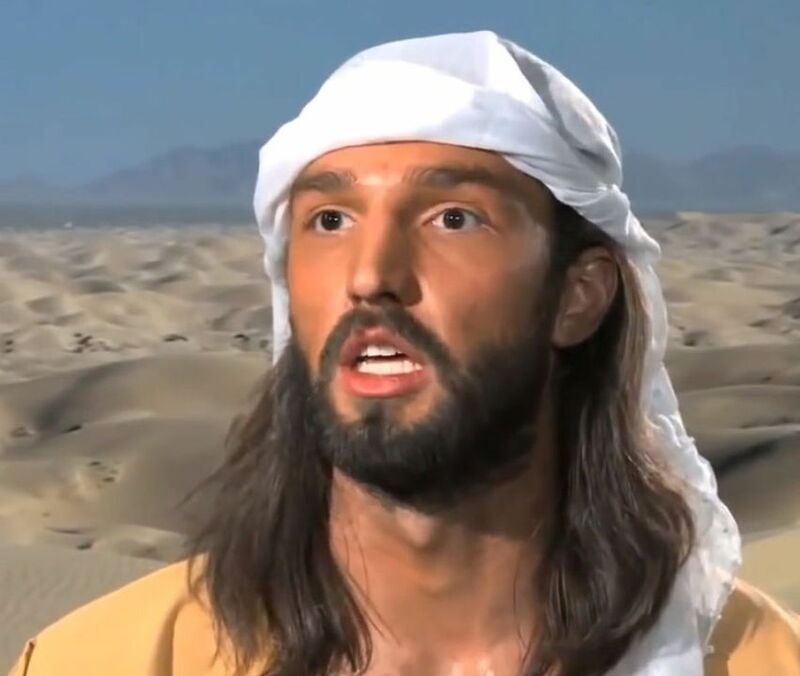 Screenshot of actor portraying Mohammed from the film Innocence of Muslims. Screenshots of actor portraying Mohammed from the film Innocence of Muslims. The 1990s HBO comedy series "Mr. Show" once broadcast an episode about religion, visible here on YouTube which briefly displayed an animated version of Mohammed (seen above in a screenshot from 0:26 in the video) floating around on a cloud alongside other religious figures and deities. ...and then getting beaten by Moses, who cuts off his head with the Ten Commandments. Spike TV originally hosted a streaming video of the Holy War ad here, but have since taken it offline. 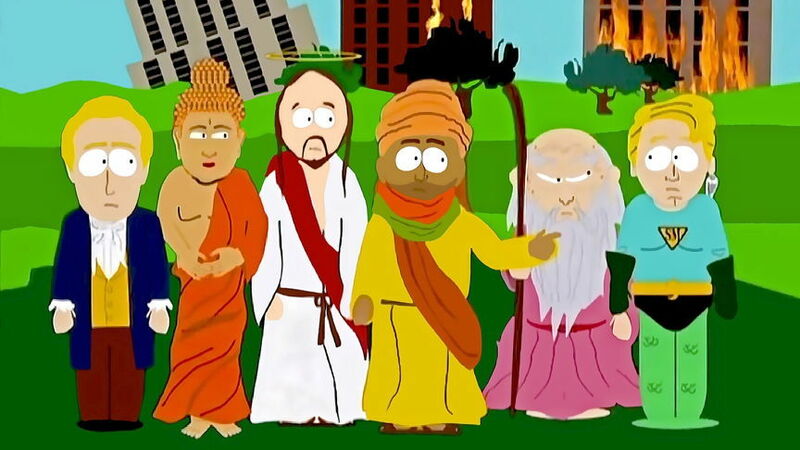 "Mohammad, Jesus & Scott" is a satirical advertisement for a situation comedy posted here to YouTube which features an animated Mohammed as one of three mismatched roommates, along with Jesus Christ and "Scott Ford." There never actually was a show called "Mohammad, Jesus & Scott" -- just this one-minute parody commercial, which portrays Jesus as the party animal to the studious Mohammed and the hapless Scott. The first screenshot above shows Scott knocking over Mohammed's house of cards, while the second one shows a party in full swing after Jesus invites all of Mohammed's "72 honeys" over for some fun. 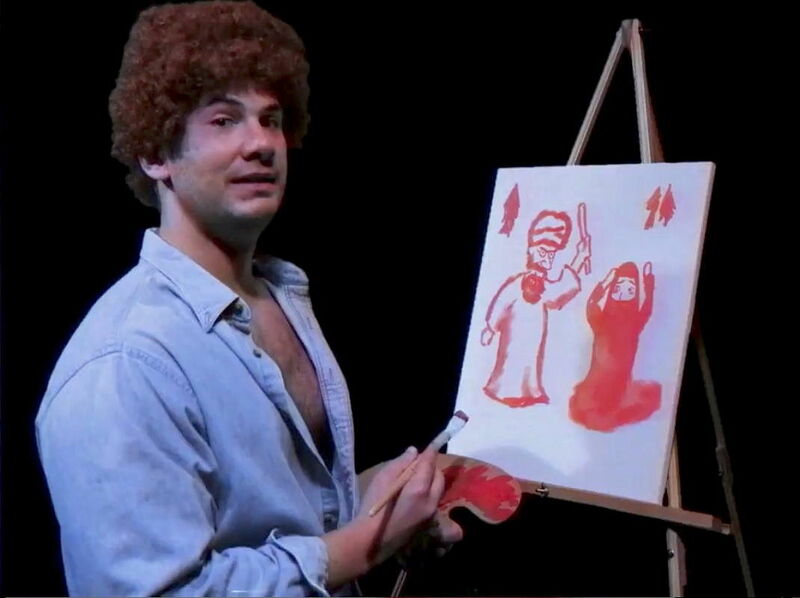 Bob Ross Paints Muhammad with Period Blood, on "Louder With Crowder"
On the June 26, 2017 episode of the "Louder With Crowder" online comedy show, host Steven Crowder made a parody version of the old television program The Joy of Painting, in which Crowder satirically portrays popular painter Bob Ross creating a new artwork out of "period blood" -- poking fun at a group of feminists who had recently filmed a video of themselves making art from menstrual blood. At the end of Crowder's parody version of The Joy of Painting, he reveals his new menstrual-blood masterpiece -- a painting of Mohammed beating his 6-year-old wife Aisha. A close-up of the finished painting, showing Mohammed beating Aisha.